Constitution day in Ukraine always falls on June 28th each year and commemorates the adoption of the Ukrainian Constitution back on June 28, 1996. 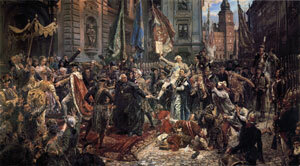 People will celebrate this day with festivities including concerts, patriotic parades with bands, and firework shows. Often the President of Ukraine will make a speech relevant to the days celebrations. On June 28, 1996 the Constitution of Ukraine was adopted. Ukraine became independent from the Soviet Union back in 1991 and eventually 5 years later adopted its current Constitution which had many changes in the area of human rights relative to its past.